UMass President Marty MeehanJuly 1, 2007 is a date that Keith Motley and I will never forget. It was on that day that Keith, with his UMass and Northeastern University administrative experience and deep roots in this community, became chancellor of UMass Boston. And on that same day, I returned to my alma mater to begin my service as chancellor of UMass Lowell. So Keith and I are joined by timing, by the fact that neither of us came to our positions with traditional academic profiles, and by being examples of higher education’s transformative power. For nearly a decade, we have worked in partnership with the board of trustees to make sure that as many lives as possible are improved, enriched, and transformed at UMass Boston and at its sibling campuses in the UMass system. As is well known by now, Chancellor Motley, after a decade of impassioned leadership and service, will step down from his current position at the end of this academic year. Some have suggested that the upcoming leadership transition at UMass Boston will result in the muting of Keith’s distinctive voice. My view is that nothing could be further from the truth. I don’t think that Keith Motley’s ability to lead and inspire is contingent upon his showing up to work at a particular office. As Keith himself noted when he spoke on this issue, the positions that we are entrusted with are not ours forever. “I pass the baton like anybody else. I’m a marathon runner. I know that it doesn’t last forever, but what does last forever is the footprint,” he said. The UMass Boston we see today can be extremely proud of its outstanding academic programs, of research that is critical to this region and its future, and of the public service it provides. The entire UMass community is grateful for Keith’s decade of leadership. Where he goes in the future remains to be seen, but one option guaranteed to him is staying at UMass Boston to teach, to write, and to speak out on the issues of the day. And, certainly, many other opportunities will be available to this dynamic and talented leader. Either way, Keith Motley’s booming voice will continue to echo throughout our region – and beyond. 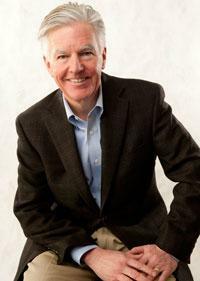 Marty Meehan is president of the five-campus University of Massachusetts system and is a former member of the US House of Representatives.